Stems: Erect, much-branched, green, glabrous or short-hairy, clustered. Leaves: Opposite, simple, stalked, ovate, 2.5 to 6 inches long, 1 to 5 inches wide, thin; bases rounded or heart-shaped; margins toothed; tips tapered; upper leaves reduced. Inflorescences: Many-flowered heads in flat-topped to dome-shaped clusters, terminal. Flowers: Heads about 1/4 inch tall; bracts about equal in size, tips long-pointed to blunt; ray florets absent; disk florets 12-24, corollas 5-lobed, white. Fruits: Achenes, tiny, 5-angled, mostly glabrous, black, tipped with hair-like bristles, enclosing small seed. Habitat: Open woods, shady disturbed sites, and stream edges. 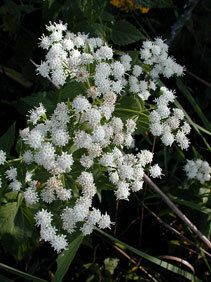 Toxicity: Though not normally eaten by livestock, white snakeroot can cause a sickness known as "trembles" when consumed. Cattle, sheep, horses, and goats are susceptible. Symptoms include weight loss, trembling, depression, inactivity, labored respiration, and inability to stand. Plants contain a toxic substance called tremetol, which can be transferred to humans via milk. The resulting illness is known as "milk sickness", and symptoms include nausea, vomiting, slow pulse and respiration, and general weakness. Abraham Lincoln's mother is believed to have died from this type of poisoning.